Whether you love rustic, modern, or mid-century, the dining room is one of your best opportunities for showcasing your sense of style in your home. But it's such a furniture-centered space that often it's easy to overlook the potential of other ways to distinguish it. Even something as simple as a coat of paint can take your dining room in an entirely new direction—giving a sense of color and sophistication that usually isn't possible with furniture alone. And creating an impact doesn't require a bold or overpowering color. In fact, one of the best colors for a dining room is gray. From it's lightest tones to it's moodiest shades, gray is a color that never fails to add drama to everything else you do in a space. Here are some of our favorite dining rooms in this mysterious neutral shade. Just about every color pops against a gray backdrop, which gives you an infinite number of options for the color story in your space. This room from Casa Vogue has varying gray tones on the wall and floor accentuate the greens of the chair and plants. Lighter tones of gray are a natural and neutral backdrop for all of your show-stopping moments. Make an eye-catching chandelier the star of the room, complemented by slick and modern dining chairs. For rooms with classic architectural elements, gray is especially good for highlighting the details. Even without an abundance of furniture, the character of the room is defined by the color of the walls and floor and the built-in design of the room. When using gray in a space, look for useful contrasts with brighter tones. The mix of colors in this room tempers the vibrancy of the yellow while energizing the relatively subdued tones of the rest of the space. 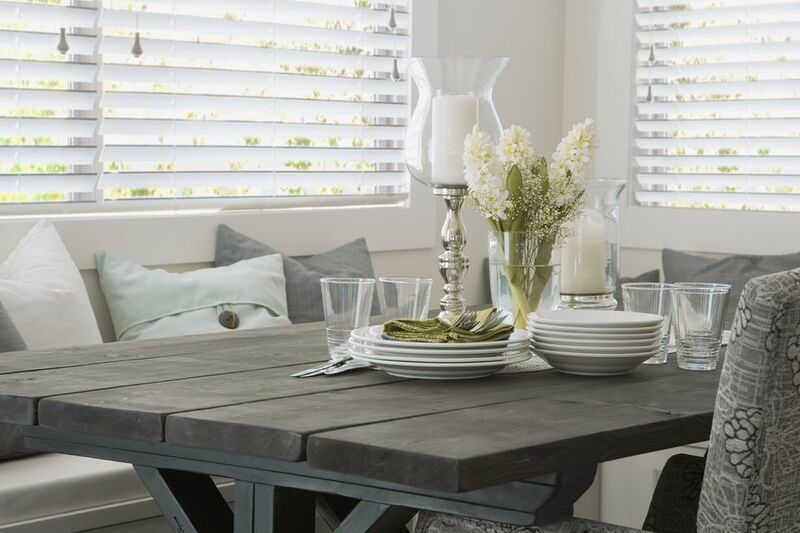 Gray is good for much more than a paint color in your dining room. The gray present in the furnishings and represented in the art give this dining room from Karen Fron an undeniable air of quiet dignity. Here again, we see gray used in several parts of a room's design from Classical Addiction. 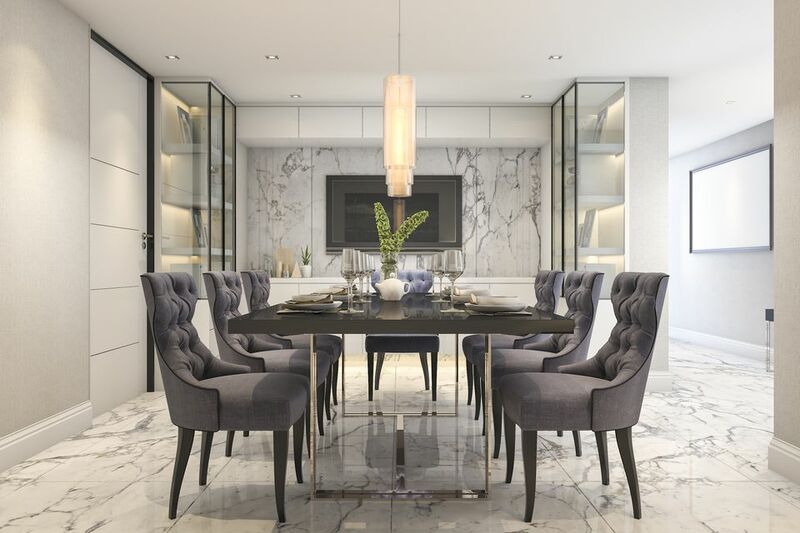 The lamps, credenza, and even the floor tie together their gray shades with the dining chairs while contrasting with the lighter tones of the doors and table. It's the perfect color palette for a space with such a classic aesthetic. Whenever you are using one color as the main influence in your space, it's always good to find interesting ways to break up the blocks of color. In this room from DecorPad a whimsical leaf-pattern wallpaper in gray maintains the color story while adding a fresh pop of pattern. If you can't match the colors as exactly as you'd like, use stencils and paint to get the look you're after. Gray is a cool color, so any time you have a big infusion of a warm color, like the painting seen above, you have the perfect recipe for a big visual moment. For a modern take on color, pair a classic neutral like gray with one of the new neutrals, such as pink. It's a natural combination that will create a soothingly pretty environment. It's always good to have natural elements in your space, and against a strong, gray background, every pop of green is going to stand out, much like this room from Jigsaw Designs. A gray rug over hardwood floors is a clever way to create continuity with gray walls while keeping some of the warmer wood tones. The combination keeps this room from Sebastian Erras Photography from feeling too cold while creating the perfect setting for the fireplace mirror to really shine. As a neutral, gray doesn't have to be overpowering. Mixing lighter shades of the color and layering them through the room will give you very much the same effect as having white walls, but with just that little added bit of character. Every shade of brown (especially the bookshelf) in this room just jumps off of the gray backdrop. If your dining room includes a lot of wood tones, then a darker gray is an excellent choice for taking what might look like an ordinary table or chair and turning it into the eye-catching center of attention. Here's another space from California Cottage where warm wood tones take center stage against a dark gray background. As before, the strength of the space is in the almost 50/50 division of colors between dark grays and warm wood tones. If you're mixing gray with a brighter contrasting color you've got a few options. One is to mix a lighter shade of gray with a darker shade of the other color—like the yellow in the dining room seen here. This accentuates the contrast by reinforcing the gray as a neutral, backdrop color. Whenever you can mix gray with other colors in a single piece, such as art or a rug, it's a good thing. It can either bring the colors you have in the room together or set the stage for adding new colors to the mix. In this room by Boca Do Lobo, the gray rug ties in the blue chairs with the gray walls and even the silver overhead lighting. The pop of color provided by these flowers is made even more appealing by the patterned backdrop provided by the patterned drapery. The white space in the drapes keeps the all-gray space from looking too color-blocked and enclosed. These large metallic lights absolutely shine in this space from Floriane Lemarie. Their warm sheen cuts through the gray space making it an instant focal point. Now, gray might not automatically strike you as the most exciting color, but that's only until you do something exciting with it. The large grayscale wall art in this dining room from ​The D Pages, really sets the space apart, taking a neutral wall and making it a focal point. Layering shades of gray in this space from​ Erika Brechtel create a cool and serene environment while the warm wood tones make it seem all the more inviting. When covering a room with gray, even white will pop as demonstrated by the modern dining room table. Just because you use gray on the walls in your dining room doesn't mean that it has to cover every wall. Using gray as an accent color in a predominantly white room makes both neutral colors shine. With each of them picking up other tones in the room like the rug and the door, the layering of colors almost takes care of itself. Simple yet elegant, gray is the perfect shade for a minimalist dining space. When decorating with neutral colors, embrace subtle ways to add interest to the walls. The light texturing of the gray wallpaper in this luxury dining room from Pinterio adds the little extra element that pulls together the aesthetic of the space. The simplest and best way to keep a dining room with gray walls—especially in darker tones—from becoming too overpowering is to fill those walls with art. The white space in the artwork shown in this dining room from Bored Art creates a break in the gray while the red adds a striking contrast that energizes the feel of the room.